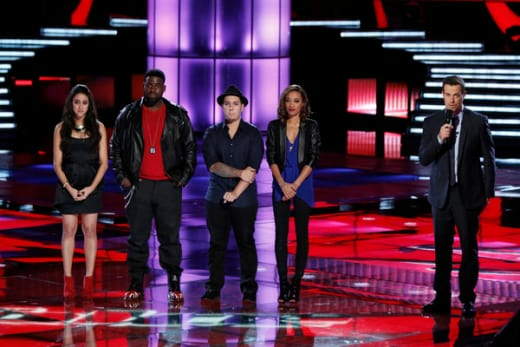 The Voice Results: Who Made the Top 8? On the heels of an entertaining and drama filled performance show Monday night, The Voice gave audiences little of either on Tuesday, cutting its group of finalists from 10 to eight. I will never make a call for the horrific group sings of American Idol fame, but these mini-group performances with coaches or special guests continue to be too long and uneventful, leaving me hating them only a little bit less. I understand that The Voice prides itself in showcasing talent, and not needing the tricks that other singing shows might go to in order to build the drama of a results show, but when you have that drama inherently built in by some of the best singers nearing elimination, you should use that to your advantage. The first two to head to safety were Team Cee Lo's Nicholas David and Cassadee Pope of Team Blake. Yes!!! They are probably my two favorites in the competition at this point, so I'm glad these two were put out of their misery early. Next to be told that they will be moving on were Dez Duron of Team Xtina and Team Cee Lo's Cody Belew. I would have been fine with Cody going home after his disaster on Monday, but hopefully his talent will bring him back to reality next week, and he can delight us again. Before the final commercial break, it was announced that Team Adam's Melanie Martinez was also safe. That makes sense, given that she and Cassadee were the only ones at the top of the iTunes chart. Five remained and one-by-one they continued to be saved by America's vote. First it was Team Blake's karaoke extraordinaire, Terry McDermott. Then Trevin Hunte of Team Cee Lo was sent to safety, surprising no one more than himself. He was not good this week, but I certainly didn't expect him to be in trouble with what he's shown in the past. The last contestant to move on to the next round was Team Adam's Amanda Brown. Here is where I take issue with the process. Amanda Brown and Trevin Hunte have easily been touted by The Voice as two of the main front-runners for weeks now. oth were in this hypothetical bottom four, and they didn't make a big deal about it at all. On Idol, the judges and Seacrest would have been hootin' and hollerin' about how this is a travesty and built the whole thing up to be the biggest event since Bieber and Selena broke up. But no, Carson moved along like it was just any other result. This is one of the moments when the coaches praising every single contestant like they are all the best comes back to haunt the show a bit. The results came, they went, and Sylvia Yacoub and Bryan Keith went home. It wasn't a big event. Sending Bryan out the door could have been a big shock for some. Having Trevin and Amanda standing up there as two of what seemed like a bottom four should have been a big deal, but The Voice didn't make it into one. Again, that's a credit to their professionalism, but it also lessens the amount of drama and suspense on a show that could always use a little more of that. What did you think of tonight's result America? Did we get the vote right, or should one of the two eliminated contestants be in the Top 8? Bryan Keith should have stayed Sylvia Yacoub should have stayed America got it right I want more of Blake resting his face in his hand!